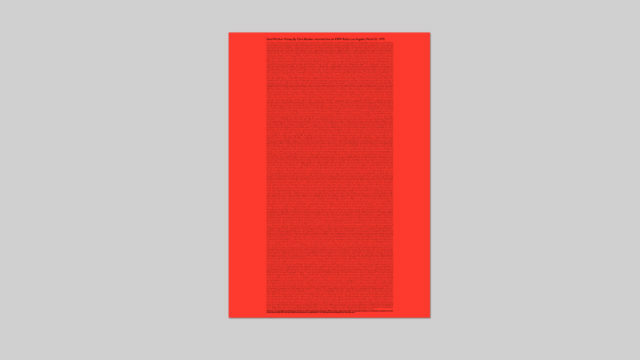 offset print poster used as dusk jacket of the book I Will Work For Yoy But Someone Else Should Pay For It, 45,5×33 cm. Trascrizione di Temporary Service di un radio piece di Chris Burden di 55:16 minuti. Il 21 marzo 1978, Chri Burden ha tenuto una trasmissione di un’ora presso la stazione radio KPFK di Los Angeles, promuovendo una raccolta fondi, non a beneficio della radio, ma per se stesso. L’audio originale può essere scaricato da www.ubu.com. Transcription by Temporary Service of a 55:16 minute long radio piece by Chris Burden. On March 21, 1978, the conceptual artist Chris Burden (1946–2015), took to the Los Angeles airwaves on radio station KPFK for a full hour and did a fundraising marathon, not to benefit the not-for-profit radio station, but to benefit himself. The original recording can ve downloaded from www.ubu.com.